Jupiter is home to one of just a few dog friendly beaches and we have several beachfront condos that are pet friendly as well. We have a few pet friendly condos that allow large 50 lb plus dogs as well. Jupiter I and Sea Colony are two popular large pets welcome communities as is Jupiter Ocean Grande. The Jupiter dog beach runs for miles and is another reason Jupiter is so popular. Many more pet friendly condos allow 35lbs and smaller dogs. Call me for a list of Jupiter pet friendly condos. Your dream has always been move to Florida and live in a condo by the beach in a pet friendly condo. That is a great idea but you have a dog. Good news, there are quite a few Jupiter pet friendly condos located on the beach or just a short walk to the Jupiter dog beach. Sure, some have restrictions on weight but we have several Jupiter pet friendly condos that will allow any size dog. Don't forget about our Jupiter dog friendly beach which is another benefit of living here in Jupiter. The Friends of Jupiter Beach make this all possible and it's a great organization to contribute to. No matter if it's a donation or a beach cleanup, it is a worthy cause for us and for Fido. Let me help you find that perfect Jupiter pet friendly condo that will allow both you and Fido to call home. There are several Jupiter pet friendly beach condos that allow large dogs such as Jupiter Ocean Grande, Jupiter 1 and Sea Colony. They range in price from $250,000 and rise from there depending upon the community. It is very rare to find condos that allow large pets but we can help you. If you have a smaller pet under 30 lbs finding a pet friendly condo will be much easier. More condos are pet friendly here in Jupiter than many other areas. If we can't find one in your budget a single family home can always be an option. Many more Jupiter pet friendly condos allow dogs 20lbs or less so finding a condo for your smaller dog will be less challenging. 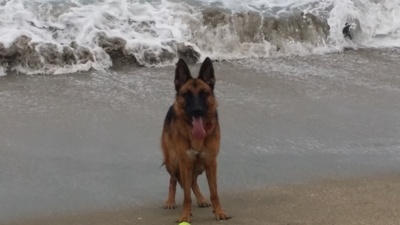 No matter if you want to live by the beach here in Jupiter or just have a pet friendly condo that allows pets there is a perfect Jupiter pet friendly condo out there for you. Feel free to bring your dog to the Jupiter dog friendly beach. You will be amazed how much fun they have playing and socializing with other dogs. Not only do they enjoy the beach but you will meet some really nice people who are dog lovers too. Don't forget to cleanup and enjoy our Jupiter Dog Beach. It is a wonderful opportunity that Jupiter offers to both the residents and their guests. Call me and we can discuss the various Jupiter pet friendly condos that will allow your dog and have the amenities you want. Come see why both you and your pet will love living in Jupiter Florida. With many Jupiter dog friendly condos just a short walk to the beach and very affordable you will be amazed how close you can be to the beach here in Jupiter. Jupiter is one of the few communities that has a dog friendly beach with very few restrictions. We have a few miles of dog friendly beaches and plenty of Jupiter pet friendly condos to choose from. You will find some great pet friendly Singer Island condos as well as Hutchinson Island condos that allow dogs as well. If you have any questions about Dog Friendly Condos in Jupiter or surrounding communities, please don't hesitate to email or call Jim at 1-561-744-7025 for assistance.